It will install Autofac also. It will register every class the ends with “Repository” in Autofac. It will register every class the ends with “Service” in Autofac. Now we can inject the Service object into the Controller class. In MVC project, Add reference of Model and Service Projects. Enter name “CountryController“, Select Model : “Country“, DataContext: SampleArchContext, Set “Generate Views” true, Click Add. Here you can see we are using ICountryService as constructor argument means CountryController will receive service layer as a constructor injection. Constructor Dependency injection makes the controller class very testable. In unit tests, we will instantiate the controller by passing a mock implementation of the ICountryService class. Now lets see one more CRUD implementation example which includes relationship. 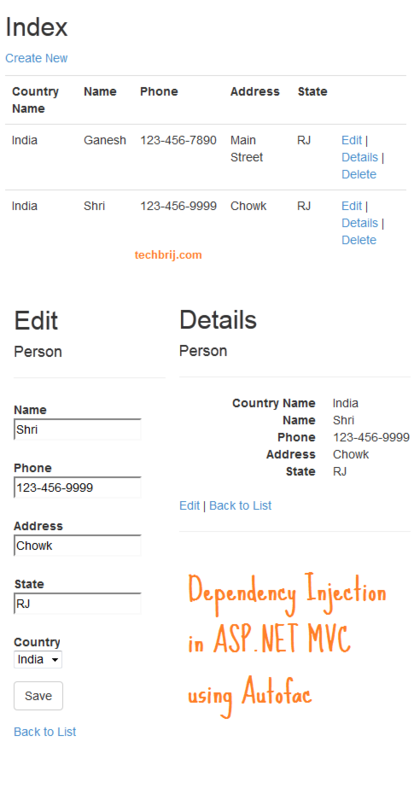 Here the controller will receive CountryService and PersonService as constructor injection. CountryService is used for Country dropdownlist and PersonService is for CRUD operations. No need to change generated Views. We have setup Autofac and implemented CRUD operations based on Generic Repository and Unit of Work pattern with Entity Framework and service layer. In Next post, we will implement Unit Testing of different layers. You can get source code in last part of this series. Hi thanks for the great tutorial. I’ve implemented this successfully, but I am also working on implementing unobtrusive validation using the Fluent Validation library. I need to inject services into some of my validator classes, but it would seem that the validator classes are instantiated before the request scope has begun since my AutofacValidatorFactory throws a DependencyResolutionException, “No Scope with a Tag Matching ‘AutofacWebRequest’”. I can get around this by updating the registration of the UnitOfWork in EFModule.cs to InstancePerLifetimeScope(). Do you foresee any problems with this change? I’ve read through the autofac docs and believe this is okay, but I am not yet certain. An autofac FAQ page (http://docs.autofac.org/en/latest/faq/per-request-scope.html#sharing-dependencies-across-apps-without-requests) indicates that as long as I am not creating my own child scopes, then InstancePerRequest() and InstancePerLifetimeScope() become effectively identical. I was fallowing this architecture and I’ve got this error, anyone can help? The type ‘WorldCup.Repository.UnitOfWork’ is not assignable to service ‘WorldCup.Repository.IUnitOfWork’.Description: An unhandled exception occurred during the execution of the current web request. Please review the stack trace for more information about the error and where it originated in the code. Exception Details: System.ArgumentException: The type ‘WorldCup.Repository.UnitOfWork’ is not assignable to service ‘WorldCup.Repository.IUnitOfWork’.